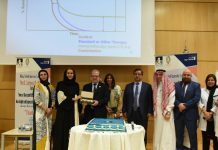 The Office of Research & Graduate Studies at Alfaisal University is pleased to announce the winners of a new internally funded Strategic Research Grants Competition (SRG 2015). 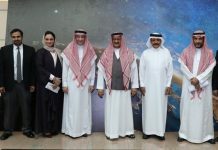 From L to R in the photograph: Garwin Kim Sing from the College of Medicine, George Kulik from the College of Science & General Studies, Ricardo Santa from the College of Business, and Tarek H. Mokhtar from the College of Engineering. 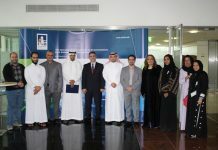 A total of two million SAR was awarded over two years in this new strategic grants competition funded by the University. The projects started January 2015. 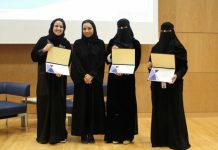 All applications were externally reviewed by international experts using a format similar to the KACST NSTIP competition. Garwin Kim Sing will be working on a project entitled: An Investigation of the Antimicrobial and Toxic Effects of Reduced Graphene Oxide (RGO) and RGO/Silver nanoparticles. George Kulik will be directing a study entitled System biology approach to develop personalized cancer therapy by tumor-selective functionalized nanoparticles. Ricardo Santa is Principal Investigator of the Smart City strategic business project. Finally, Tarek Mokhtar is investigating a Science & Technology project entitled: iCE: An intelligent Classroom Environment to Enhance Education in Student-Centered Higher Educational Institutions.